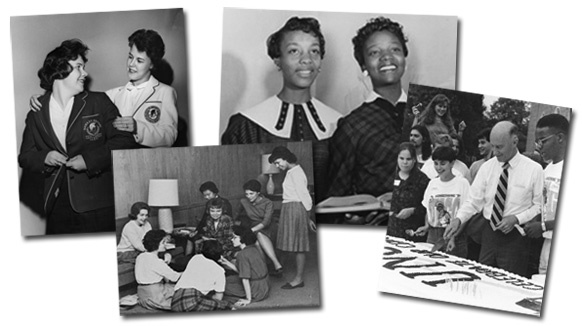 The UNCG Oral History Collections website currently includes material from several oral history collections. New interviews are added regularly to the online collection. Material from additional oral history projects and collections will be added in the future. All interviews are housed in the Martha Blakeney Hodges Special Collections & University Archives of UNCG University Libraries. The University of North Carolina at Greensboro (UNCG) Institutional Memory Collection was established in 2006 by the University Archives to preserve the history of UNCG through oral histories. Archives staff members have interviewed alumni, faculty, and staff to record the untold memories of their experience at the University. The African American Institutional Memory Project, part of the Institutional Memory Collection was established to preserve the memories of the black alumni who attended the college during the 1960s. The UNCG Centennial Oral History Project collection contains over 160 interviews conducted in the early 1990s under the direction of Dr. William Link, Chair of the Department of History in connection with the school's Centennial Celebration. The collection includes interviews with alumni, current and former administrators, and others directly connected to the school. The interviews were transferred to the University Archives by Link in 1991 and are being added to this site as resources and time allow. The Preserving Our History: Rotary Club of Greensboro oral history project is a collaboration between the Martha Blakeney Hodges Special Collections & University Archives and the Rotary Club of Greensboro. The project seeks to document the lives of Rotary Club of Greensboro members, as well as a wide variety of issues regarding the history of Greensboro, including economic shifts, race relations, the Great Depression, philanthropy, and religious diversity. UNCG Alumni Association Oral History Program conducted interviews with alumni and former staff between 1972 and 1979 to record the memories of the university’s early days. The oral histories were to be featured in the Alumni News from time to time. The Centenary Project was established by the Alumni Association in conjunction with history professor Dr. Richard Bardolph in 1980. The purpose of the project was to preserve the memories of female students who graduated from the State Normal and Industrial College, now The University of North Carolina at Greensboro. The interviews focus on alumni who graduated in the early 1900s and include discussions with Gertrude Carraway, Edith Haight, May Williams Hicks, Ethel Harris Kirby, Ione Mebane Mann, Mabel Merritt, Ruth Whittemore Sherrill, and Jane Summerell. The UNCG in the 1960s Oral History Collection contains interviews conducted by students in Professor Peter Carmichael's HIS 520: Southern History "Interpreting and Presenting Southern History to the Public" class taught in the Fall of 2006. Students were instructed to interview either an alumni, faculty, or staff member who was associated with The University of North Carolina at Greensboro during the 1960s. Students were asked to focus on a specific issue or event related to the university's history. Documenting the history and contributions of women in the military from World War II to the present. Interviews with community members about the postwar movement in Greensboro, dating from the 1970s to the present. Primarily interviews with Greensboro residents dicussing the city during World War II.